Fall is here in the Midwest and this has turned the days shorter and the nights longer. The air is crisp and the nights are flirting with the freezing mark. This is a perfect clue that it is time to hit the local rivers for the golden night prowler, Mr. Walleye. Most fisherman hang up their long rods for the winter and are completely unaware of what a good fishery there is to be had locally, especially on the local rivers. Now is the time to break out the waders or the boat and hit the rivers for the walleye bite in the darkness. With the cooling air temps and the shorter days the Walleye are feeding heavily on the given forage in the watershed. These fish are bulking up for the long winter and the spring spawn. Even in this cold water these fish are very aggressive and will easily attack a flashy presentation. These fish are going to become very active in the coming weeks and there is no time like the present to plan an outing to find these active fish. With the falling water temperatures the walleye are making their migrations up toward the dams and their wintering holes. Personally during this time of year I like to break out the heavy clothes and the neoprene waders and start chasing the marble eyes during the cold evening hours. Wading allows me to hit areas of the rivers that might not be accessible by boat or from shore. These fish are holding in the deeper holes surrounding the rocky flats in the rivers. These flats tend to congregate the baitfish and the walleye will move up out of the holes and onto these flats to school up the bait and eat at their will. Look for stretches of river that have long gravel flats with slower deeper water nearby. The water change doesn’t need to be very drastic, but enough to slow down the current a bit and allow the fish a place to hide in ambush. Some rivers you will find that the walleye will actually tend to hold tighter to a muddy bottom that is near a flat. The bottom structure is important, but not as important as the transitions between the structures. By this I am talking about a transition between rock and mud or from a rocky flat to a slow eddy. These transitions are areas to key in on. It doesn’t take a lot of gear to chase after these fish. I prefer a 7’ ML fast action-spinning rod spooled with a good quality 8lb line and my bait selections are pretty basic. Jerkbaits like the Spro McStick or an X-rap minnow are some of my popular choices. These jerkbaits tend to produce the best strike provoking action. Other jerkbaits or minnowbaits in a small to medium size are also quite effective. I like a floating style minnow bait because if you end up bumping a rock or wedging it into a crack in the bottom often times a quick flick of the line and the bait will float right back up out of the snag. A simple twitch/pause retrieve is all it takes to get a good strike from these fish. Blade baits or even small lipless cranks can be quite productive as well. The Spro Aruku Shad jr. is a popular size for shallow flats or for probing the deeper holes. The lipless style crankbait allows the bait to use the current to induce action and noise that will often trigger an aggressive reaction strike. Because this bait does not float it allows you to let it work the deeper areas where staging fish may be holding. Last, but not least, the ever popular jig should also be part of your arsenal. Typically a good round head ball style jig with a light wire hook works best. The head keeps it from snagging too much and the light wire allows you to pull it free from most snags. Tip the jig with a good twister or paddle style tail in white, chartreuse, or on some occasions a dark red is very effective. The darker color will give you a much larger profile in the dark. These presentations will allow you to probe any depth of water and allow you to get into areas that are holding fish. The key is to locate these fish holding areas during the daylight hours and then you can find them much easier in the darkness of the night. 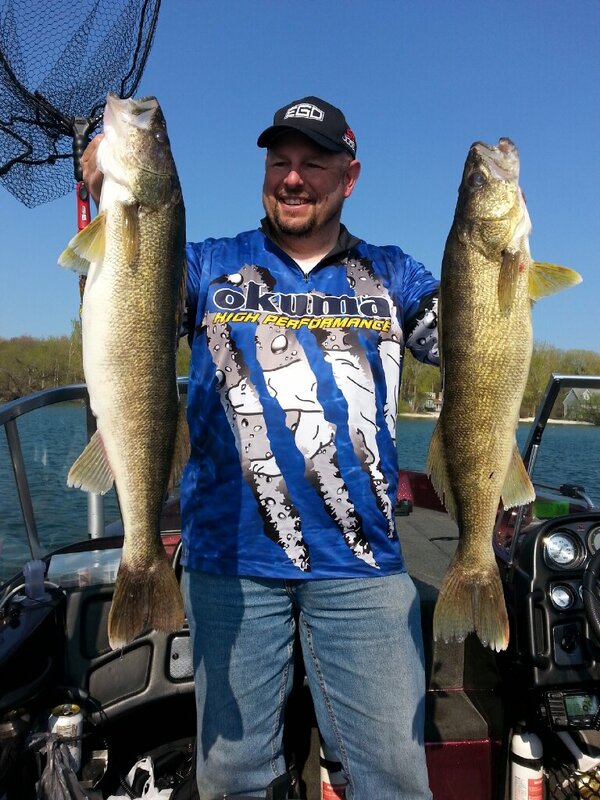 Not only will you find a walleye or two you could also tangle with a big smallmouth or even a Musky. Just because the air temp has dropped and the water is cold doesn’t mean that you have to hang up the waders and the spinning rods. It is just the start of another opportunity that you can take advantage of that is local and is easy to gear up for. Don’t be afraid of the dark, get out in the river and find some of those ole Marble Eyes!